Businesses ultimately succeed or fail based on their ability to create and manage a profitable business. The combination of a competitive, global environment and mandatory regulatory compliance means that successfully managing finances is one of the biggest challenges and opportunities a business can face. While there are many technology solutions aiding the finance industry, there are no proper control systems to regulate the ‘always-changing’ rules of regulatory boards. It is essential to put reliable solutions in place to drive efficiency and performance–not only in the finance department but throughout the organization. Existing players and new entrants are increasingly embracing new technologies like Cloud and Big Data to power the Financial Management Softwares. This innovative approach is elevating industry standards and helping all the players in the channel to be more dynamic and operate more efficiently by accelerating financial close, providing strong expense management, offering streamlined and auditable revenue management and ensuring complete real-time visibility into the financial performance of the business. With the new technologies, vendors are helping every business achieve sound financial management, from general ledger journals to sophisticated fiscal reporting, monitoring and enterprise performance management. They are directing financial companies and institutions to a new phase—shifting from age old processes to modern and easily deployable solutions. In our selection we looked at the vendor’s capability to fulfill the needs of the finance sector through the supply of a variety of services that support core business processes, including innovation areas related to cloud, mobile, Saas, PaaS and ERP, Big Data and analytics, mobility, and social media in the specific context of the finance industry. We also evaluated the vendors support for bridging the gap between IT and Operations Technology. 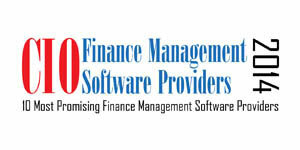 We present to you CIOReview’s 10 Most Promising FMS Providers 2014. Allevo Provider of solution for processing financial transactions to corporates, financial and public institutions. Axletree Solutions A bank communication and treasury automation specialist, providing end-to-end solutions to banks and Fortune 500 companies worldwide. BlackLine Systems A provider of Software-as-a-Service-based solutions that automate the entire financial close process. Blytheco Modern ERP Blytheco provides business management software and consulting services to the mid-market. Certify Certify is a web-based travel and expense report management software provider. Techwave Consulting A provider of Enterprise Resource Planning, Enterprise Performance Management, Business Intelligence and Business Performance Management consulting services. Tidemark Tidemark brings modern, cloud-based financial and operational planning, consolidation and analytics to the entire enterprise through unique, intuitive apps. Xactly A provider of cloud-based sales performance management applications. Xignite Offers a unique cloud-based financial data platform that provides curated financial market data and data management technology to app developers, stock exchanges, and financial institutions. Zuora Zuora delivers SaaS-based billing, commerce and finance solutions for taming operational complexities of businesses with recurring revenue.